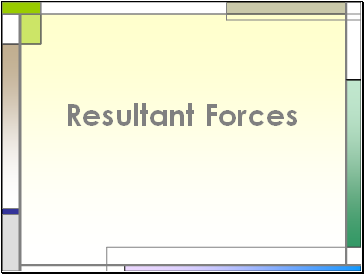 If two forces act together on an object, their effect may be described as the action of one force. Two forces of magnitude 5N and 6N act on a particle. They act at right angles. 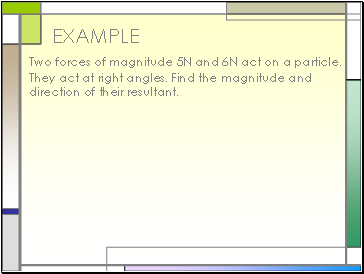 Find the magnitude and direction of their resultant. Two forces acting on a particle have magnitudes 8N and 3N. The angle between their directions is 60°. 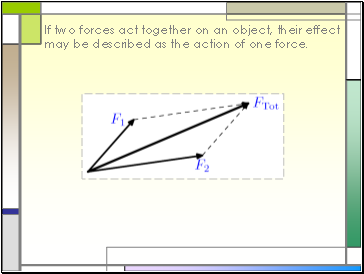 Find the resultant force acting on the particle. Three forces (2i – j) N, 3i N and (-i + 4j) N, where i and j are unit vectors due east and due north respectively, act on a particle. Find the magnitude and direction of the resulting force. Forces P, Q and R act on a particle at O in the plane of the coordinate axes Ox, Oy, making angles p, q, r respectively with Ox in the first quadrant.